The Secretary of State of the United States of America hereby requests all whom it may concern to permit the citizen/national of the United States named herein to pass without delay or hindrance and in case of need to give all lawful aid and protection. 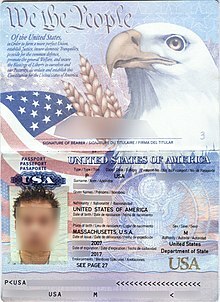 Le Secrétaire d'Etat des Etats-Unis d'Amérique prie par les présentes toutes autorités compétentes de laisser passer le citoyen ou ressortissant des Etats-Unis titulaire du présent passeport, sans délai ni difficulté et, en cas de besoin, de lui accorder toute aide et protection légitimes. El Secretario de Estado de los Estados Unidos de América por el presente solicita a las autoridades competentes permitir el paso del ciudadano o nacional de los Estados Unidos aqui nombrados, sin demora ni dificultades, y en caso de necesidad, prestarle toda la ayuda y protección licitas. ^ 72 Fed. Reg. 74,169, 74,172 (2007) ("Global Interoperability of the Passport Card"). ^ Passport Statistics: U.S. Passports Issued per Fiscal Year (2006 - 1996). 美国国务院. [2007-10-14]. ^ 10.0 10.1 Design of the New U.S. e-Passport. 美国国务院领务局. [2007-10-14]. 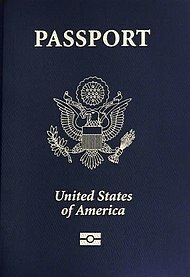 ^ Department of State Begins Issuing Electronic Passports to the Public. 美国国务院. 2006年8月14日 [2007-10-14]. 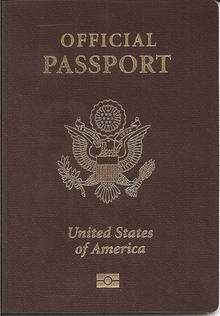 ^ The U.S. Electronic Passport. U.S. Department of State. [August 25, 2010]. ^ Frequently Asked Questions: Passports and Citizenship Documents: How long is a passport valid and when should I renew my passport?. 美国国务院. [2007-10-14]. ^ Applying for a Second U.S. Passport. 美国驻瑞士伯尔尼大使馆. [2007-10-14]. （原始内容存档于2005-02-18）. ^ U.S. PASSPORT CARD. Retrieved 17 April 2008. ^ Global Ranking - Visa Restriction Index 2017 (PDF). Henley & Partners. [28 June 2017]. Krueger, Stephen. Krueger on United States Passport Law (Hong Kong: Crossbow Corporation, 1999 and supplements) (2nd ed. ).